Bishop John J. McIntyre gratefully accepts a $1,000 donation for Catholic Social Services. Santa Claus arrived early Friday, Dec. 21 with Christmas presents for little boys and girls, at perhaps an unaccustomed stop: the Archdiocesan Pastoral Center in Philadelphia. 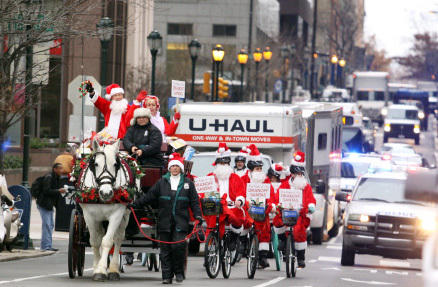 In this case, the Santa suit was donned by real estate developer Carl Dranoff, as he led a horse-drawn carriage loaded with more than 100 gifts through center city. He was joined by 15 Santa’s helpers from Dranoff Properties on bicycles – picture men and women , the tall and the small, in Santa suits, white beards and, considering safety, bicycle helmets beneath tassled red hats. 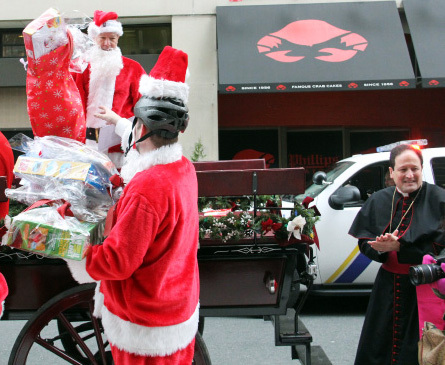 The cheerful spectacle wound along center city’s streets on a blustery cool Friday morning to the headquarters of the Archdiocese of Philadelphia to bring presents to about 85 foster children who visit Casa del Carmen. The family services agency in North Philadelphia is operated by archdiocesan Catholic Social Services (CSS). 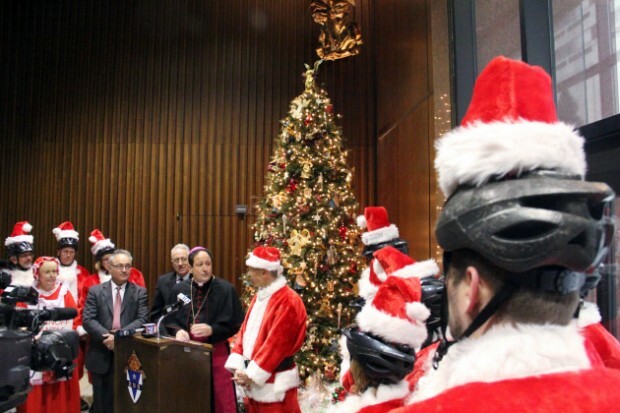 Auxiliary Bishop John J. McIntyre and CSS officials welcomed Dranoff and his team to the building in front of its 20-foot-tall gleaming Christmas tree. Last September his company launched a bike-sharing program for residents of his properties. He also presented a $1,000 check to Bishop McIntyre for Catholic Social Services. The bishop said he was grateful for Dranoff’s generosity and all those who donated the gifts. Santa’s bicycling helpers unload presents destined for children at Casa del Carmen outside the Archdiocesan Pastoral Center Dec. 21.